IT’S not every day you’re asked to join one of Maybole’s finest organisations on their trip to Spain. MAYBOLE Pipe Band, led by Pipe Sergeant Kevin McDermott, were invited by the organisers — Asturias Pipe Band “Esbardu” — to represent Maybole, South Ayrshire and Scotland in the “VI Festival Inercelticu” held in Aviles, Northern Spain from July 25 to August 5. I was lucky enough to be asked along as an observer, and was nominated stand-in big drummer until the band’s infamous drummer arrived. The festival has grown in stature over the last six years, and now some of the best professional groups from Celtic regions all over the EU participate, each demonstrating their own musical styles, dances and costumes. Maybole Pipe Band’s performances were enhanced by the expertise of the Aileen Robertson School of Dancing, represented by Cheryl Campbell, Laura Kerr, Rochelle Kerr and Claire Smith, and also the fine talents of Davie Anderson, Maybole’s local folk singer. Combined, what finer ambassadors for Scotland could you ask for? After a great deal of organisation and effort on the part of Bryce McCulloch, two flights and a five-hour bus journey, we finally arrived in the not so picturesque city of Aviles, along with our guides for the week, Susanna and Rudolph. 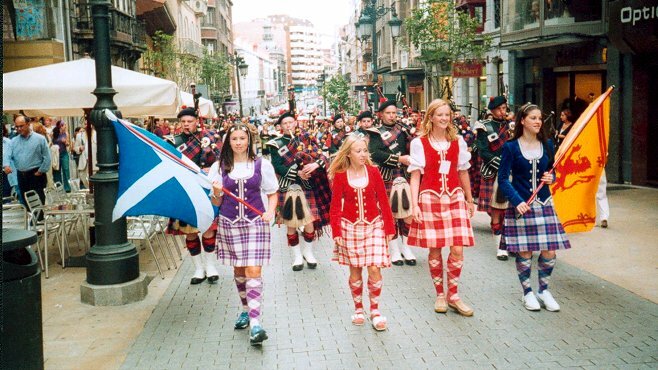 Throughout the course of the festival, the band and dancers marched and performed in several towns around Asturias, the region in Spain, receiving critical acclaim in several newspapers: front page news no less. ‘Scottish Day’ on Day 5, gave the band and dancers the opportunity to really shine. Performances in the square and shopping centre, followed by a country dancing workshop and a one hour 15 minute performance at 9pm, attracted crowds of nearly 500. This long performance also featured Davie Anderson and Bryce McCulloch with their unique performances on guitar and small pipes. Davie then led the band into a rousing rendition of Flower of Scotland. Following ‘Scottish Day’ the band played at several more events, three of which really stood out. The performance and exchanging of gifts, along with all the other Celtic groups for the Mayor of Aviles in the Town Hall was shown live on TV. The closing ceremony in the Town Hall Square again combined all Celtic groups and featured an historic re-enactment of an Asturian Battle, with Scottish narration by Fergus Cook. But, for me, the greatest moment of all was when Maybole Pipe Band and dancers closed the evening’s entertainment in the Town Hall Square at 11.30pm on Day 10, to an audience of around 1,000 people, marching off stage to Scotland the Brave, and rapturous applause. In the 12 days the band had only one day off. The weather wasn’t typical of Spain, in fact it was the worst summer in 18 years, but we did get to the beach, and it was spats off and brave the cold Atlantic. 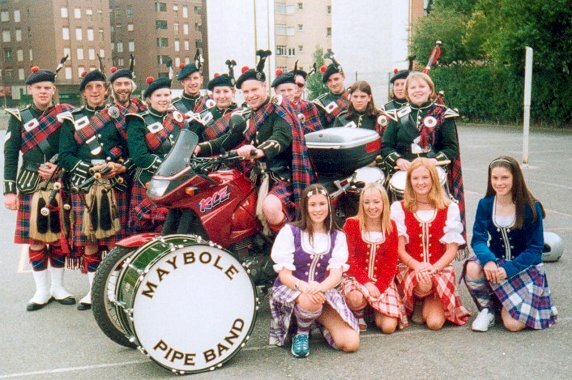 Maybole Pipe Band were treated in Spain like long lost friends. I don’t doubt for a second that this would be the case wherever they go for they are the most entertaining, sociable and welcoming group of people I have ever met. Strong bonds have been created with the people of Asturias, and also the Irish Dancing group from Drogheda, and future visits to Aviles seem likely. At every moment the band were eager to represent their culture. extend the hand of friendship. For me, it was a pleasure to be associated with this fine group of people. The article above appeared in the Ayrshire Post August 30th 2002.